An array of questions from we’ll eat your fingers off to a romantic comedy… with zombies. The Picture Round is on Cockney Rhyming Slang and the Wild Card is a travel stat about a super sized star. Q04. In 1987 which global fast food chain mistakenly translated their famous (finger lickin’ good) strapline to ‘We’ll eat your fingers off’ when they launched their first outlet in China? Q13. Les Paul famously pioneered the solid-body electric guitar for which company? Q21. In which Euro 2016 national football team did every player bar one have a surname ending with son? Q33. “A romantic comedy. With zombies.” was the tagline to which 2004 movie? Quiz 081s Picture Round is Cockney Rhyming Slang, can you match the phrases to the images? 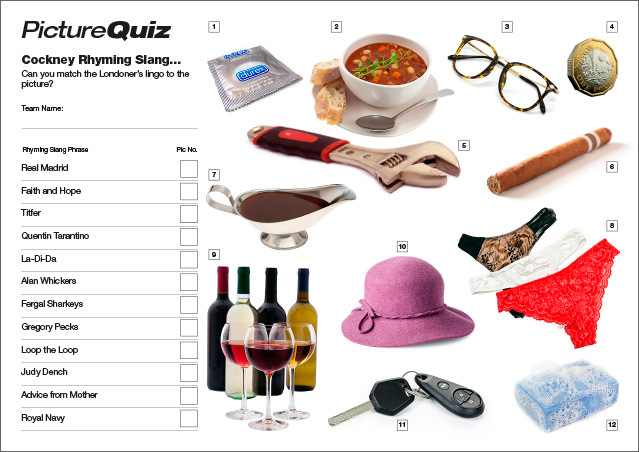 Above is a low-res sample of the Quiz 081s Cockney Rhyming Slang Picture Round, click for a higher resolution version. The Picture Round download is a two page high quality PDF with the answers on page two. Quiz 081s Wild Card Question is a mind blowing statistic about circumnavigating the biggest known sun in the universe.